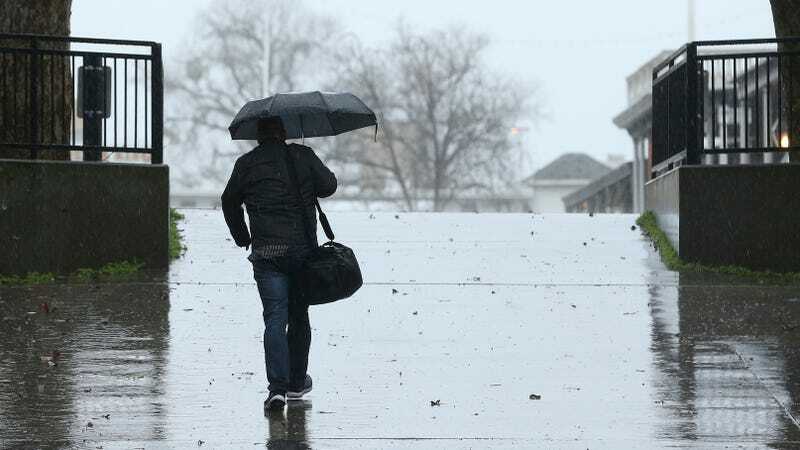 Rain fell in Sacramento on Wednesday, as an atmospheric river delivers moisture up and down the state. 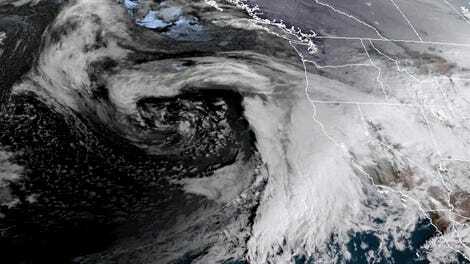 Atmospheric rivers are exactly what they sound like: long, narrow, sky-high bands of moisture originating in the tropical Pacific that speed across the ocean toward the U.S. West Coast, unleashing rain at lower elevations and snow at higher elevations. According to the National Oceanic Atmospheric Administration, big atmospheric river events can carry roughly the same amount of water as the mouth of the Mississippi. Just a few of these events can deliver half of the West Coast’s annual rainfall, making them an important source of replenishment for ever-precarious water supplies. But when they’re as intense as the moisture plume that began to arrive this morning, they can also cause flooding, which parts of the the Bay Area are already starting to experience. As warm, moist air sweeps over snow-covered mountains further inland, it’s likely to melt snow that’s been building up at mid-elevations, triggering even worse flooding for communities in the foothills. At the highest elevations in the Sierra Nevada, the remaining moisture will be squeezed out as snow that the National Weather Service says could total up to a whopping seven feet in some places. Daniel Swain, a climate scientist at UCLA’s Institute of the Environment and Sustainability, said the rain California’s poised to receive “could really decimate the middle elevation snowpack” that’s been building in the inland mountains between about 3,000 and 5,000 feet of elevation. “Tonight, the big flood risk looks like it’ll come in those regions,” Swain told Earther. Further south, Los Angeles is starting to pick up some light rain, with a lot more expected on Thursday. The National Weather Service Los Angeles is calling for 1-2.5 inches of rain along the coastline with 2.5-4 inches of rain and even higher totals locally across the foothills and mountains through Thursday night. That raises the risk of roadway flooding as water hits soils that have already received more than their average dose of wet season rainfall. And floods aren’t the only worry: as all this water hits barren landscapes recently torched by wildfires, it could destabilize the soil, triggering rock and mudslides similar to those seen near Santa Barbara last year. You might be wondering if all this wild weather is in any way connected to Seattle’s recent run of epic snowfall. The short answer is, kind of! Swain explained that the same atmospheric setup that’s caused volley after volley of precipitation to fall as snow over the Emerald City—namely, a parade of storms marching down the West Coast and encountering Arctic air over Western Canada, possibly a remnant of the recent polar vortex disruption—has also brought a substantial amount of powder further south into California. That’s part of the reason snowpack levels are high right now and flooding from the incoming tropical moisture could get hairy. Swain also emphasized that the merging of the subtropical jet stream bearing this week’s atmospheric river with the cold air already in place will create “a big complex storm system” that could be difficult to predict. As a final note, this week’s rain event will be the first atmospheric river scientists can classify according to a brand-new scale. Developed by researchers at the Scripps Institution of Oceanography and detailed last week in the Bulletin of the American Meteorological Society, the scale takes into account the amount of time an atmospheric river lingers over an area and the amount of water vapor contained within it to give the event a 1-5 intensity ranking. In a sense, it’s not unlike the Saffir-Simpson scale used to rank hurricanes. “That’s where the impacts are expected to be high enough there’s mostly hazardous rather than beneficial,” he said.